"Don't Believe Us... Read What People Are Saying!" "I just wanted to share another blessing with you. I recently put a little more than $100 under my pyramid and won $100 on a scratch off. (Remember my mom won $1050 after putting $1000 under hers) This energy is amazing. I'm trying a little experiment, I'll let you know how it turns out. Thanks again! Very powerful!!" violetmango- "ahh okay haha i thought it would take a while :) but not long after i txt you i had bubbly feeling in my throat and solar plexus aswell as in my mouth i had the self expression mini closest to me the othr 2 i placed upstairs for now and my mother had some marks on her nose that have been their for a long time and i placed the negative energy mini nxt to her bed and they where gone so they must be working they should get even stronger in a few weeks then :) thank you when i have the money i will be looking forward to buying more minis peacex ... oh and my cat seems to want to play with it alot :) ... oh and i used a crystal pendulum over the minis and it went crazy way more than without one :)"
Carolyn R. (New Brunswick, Canada) -" Our Pyramids are living happily all over our house now! Thank you SO much for your amazing work! we've all seen a change in the atmosphere in our place..even the kids has said so! LOL thanks again for your generosity! We will be ordering again for sure! Take care!" Cassandra S. - "I am very pleased with my purchase. I brought this for my mother and she can not part from it. Thank you for hard work in making these beautiful pyramids!" Cassandra S. - "Thank you so much! There is very powerful energy within all the pyramids I purchased and I am pleased that the atmosphere in my home has been calm since their arrival." Peony - "Perfect pyramid! Made a lovely gift for someone." Elizabeth - "Love it so much that I decided to buy 2 more! Thank you for the speedy delivery!" Lisa Parker - "This was a graduation gift that was perfect!" Paytone Schnarre -"This pyramid was buzzing even before I opened the box. Very satisfied"
Elizabeth - "We couldnt be more happier with this. This white Orgone Pyramid is really beautiful." MsLeigh7 - Greetings Dr. Neb Heru: I'm ecstatic!!! I received my 3 pyramids yesterday in the mail. I cleansed them with “White Sage Smoke.” this morning in the Sun. I can feel the Powerful & Positive energy!! Awesome CD!! Thanks again! 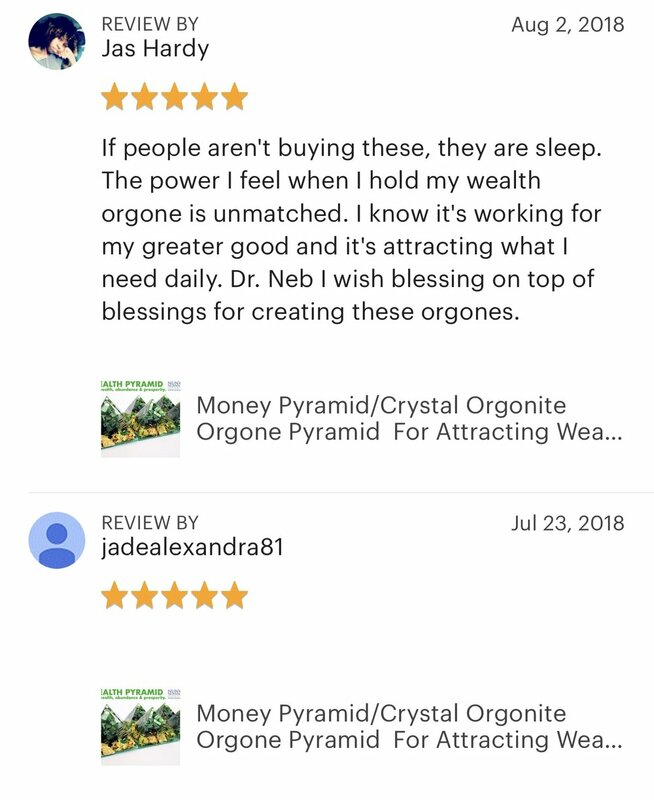 (Testimonal #2 by MsLeigh7) - These pyramids have helped me a great deal...especially Wealth Attractor, I received a bonus and salary increase out of the blue. The only thing I could think of was carry this pyramid everyday was what made this happen...could'nt wait to send an email. The Supreme Protector...The Truth! I was experiencing a lot of negative energy flowing my way...now it's change into nothing but positive vibes/aura...Loveing it! 3rd Eye Ascension...this pyramid has helped me a great deal lining up my charkas and get more into mediation. NuNu Porshia - IT CAME!!!!!!!!!! !1 omgssssssshhhhhhhhh im sooooooo happy!!! I LOVE IT!!!!!!!! THANK U SOOOO MUCH GOD!! lol excuse all the exclamation marks im just so excited! JR Cyrus - I love my nun mini by the way It has already fine tuned my vibration frequency - I noticed last night that my head isn't 'buzzing' clouding my thoughts with anxiety, confusion and negativity. I now experience a calm humming that delivers ideas to me with clarity! Samira StarSeed Blount - I received my Nunergetic device today and just unwrapped it!! Wow!! it is fabulous!!! Luis Torres - I ordered 3, it feels so good, so relaxing that I can barely hate/get mad/angry if I wanted to. Lovneet Fielder - Raahub! I received my Nunenergetic device today I'm enjoying it already! Angela Baker - Hey Dr. Heru!! I love it.. as soon as I got it, I mean literally after I opened the box, I did a 11 minute meditation. The base of it was soo warm, near hot, it was charrrggged! I placed it over my 3rd eye, lied down and did an impromtu meditation.. loved the energy.. dayum near gave me a headache..lol. I place it random places in the house. For a ‘mini’ its ALOT bigger than what I expected! Amun Re Ptah (London UK) - Blessings, Raahub Neb, my nun-energetic device arrived this morning, wow sun, eye am very impressed with your great work, thank you for the gifts also, much appreciated. Ti'Akha Thabit - Wow, So much has taken place. Alot of negative situations with different people has been ironed out or done away with! Some situations I chose to iron out. Some I didnt feel was worth ironing oit. This was all done without hostility anger and straight forward with clarity! Karen L Glover - I have my package! Got it today and it is beautiful! Nekeyah Eridu Crumpton - Greetings! Ty for my pyramid! I love it! and ty for the crystals! David Jahi-Husani Baniti Robinson (2nd Order!) - Ahhh man, that joint really does have some etheric energy with it, I'm clairsentient and clairvoyant, and when I hold it during my meditations It makes the connection more fine tuned. Another interesting thing is it is very groundind as well! I will def. Be ordering more from you! Deidra Holt - I got my Mini Pyramid, beautiful & meditated the first nite I got it, I physically felt the power from it! Amazing NRG! Elizabeth D. Bryant - PEACE!!! THANKS AGAIN FOR EVERYTHING! I FEEL THE VIBRATIONS AND ENERGY FROM THE NUN PYRAMID.. I THOUGHT I WAS SLEEPY BOUT 2HRS AGO.. BUT NOT ANYMORE!!!! I HAVE SO MUCH ENERGY FLOWING THRU ME RIGHT NOW..SO I FELT LIKE COMMUNICATING WITH U!!! Nicole Saunders - Hahaha. Thank you for the friend acceptance. Yeah I really want to tell you about my experiences with the crystals. As soon as I got them, I started to feel negative, not sure why. And then as the day progressed, I felt like it was the negative energy that had been stored up inside me for so long. Well I think it was being released. anyway, since then I have been feeling much better, and more positive. And even if I wanted to get mad it couldnt last long. I also wanted to tell you that I have some "psychic" abilities. I wanted to know if the crystals will help me with that area as well. Also last night I had a dream that I had seen the sun in my eye...not sure if that was from the crystals or not. Ok brother, thank you so much for making the crystals. Talk to you soon...and once again thanks. Harmony Love "Device" - So i received my pretty device. I see that i have a lot going on in there. Will i need to recharge it after a while? Will it help me throughout my daily activity even if it's not with me Will i need to say affirmations while i have it then leave (I currently say my affirmations when i'm already out the house) or will i need to carry it? I'm looking to do a ritual everyday with it to have the maximum impact and get the most out of it. I put it by my bed. Dre Gravy - WOW I just received my nun pyramids. Amazing luv u 4 life 4 creating these devices there da best ya dig... Is this a Amethyst healing stone u put in the lil bag along wit 2 incents an tea candle! Trish Bailey - Peace God !I received the order and unwrapped everything today. I was very joyfyl to receive them and could feel the love and care that went into preparing my order. They're all so beautiful!!! I've been enjoying listening to the OM cd and will charge the pyramids this week. I'll be sure to share the cards that you sent with any like minds I meet Again....THANK YOU!! HighVibe Freque - Worked/Working on my pyramid. I sensed the charge and energy in it as opened it. I tried to clear off some residual energies by smudging and cleansing. Yet, I still "feel" the energy of that whom put forth the work to construct it. My spirit has a way seeking out. So I wish to beg pardon now. I have consecrated it and am in the process of programming and intergrating it with my own energies/spirits. Thanks again. Sasha Imani - LMAO!....ITS WORKING! BUSY BUSY BUSY... AS YOU KNOW... I WORK IN A HAIR SALON. I NOTICED MY CLIENTELE PICKING UP AS SOON AS IT ARRIVED. BUT AS SOON AS I BROUGHT THE DEVICE TO THE SALON,.....IT WAS ON. CUSTOMER AFTER CUSTOMER AFTER CUSTOMER!! MORE AND MORE NEW PEOPLE ARE BEING ATTRACTED TO THE SALON EVERYDAY! Kenrick Sholto Jr. - My pyramid came today and I feel better already. I have it in my pocket while I'm out with my daughter. It's fly too. Jason Miller - Peace and love family, received the nun mini and crystals today. I was kinda expecting the green technology kit but the AUM audio CD makes up for it lol. I'll be making another order soon. Chisom Azuonye - Brother Heru, just letting you know I recieved my nun mini and om tone cd today and I love it thank you. I will also be getting the love attractor and third eye pyramid very soon I will let you know. Thank you!! Lovneet Fielder - Raahub (Greetings) I received my Nunenergetic device today I'm enjoying it already and thanks for the extra stones and sachet and the cd as well I really appreciate that have a great week WADU~ 9ine mind. Terrane Hicks - Peace God I recieved the package today ! it was a present for my wife and she loves the pyramids I appreciate your work watched all of your youtube videos you are truely a GOD as your ancesters continue your work hotep! Angela Auset - Peace Dr. Heru! The NUN pyramid is GORGEOUS.. yooo I swear I can feel the energy through the pics.. Astounding.. wow..I can’t remember the last time I’ve been this excited about a healing device! IM very excited about the NUN Mini, and YES I will be featuring these products. Thank you for allowing me to offer your devices to my clientele Im sure they'll be a hit! I will be in touch.. have a blessed day! Zuberi Zulu - Peace fam i recieve my package today nice my daughter loves it thanks, thanks for the cd very relaxing! Heal Eye Self - My pyramid sits on my dashboard, I never hit the road without it Lovin my Nun pyramid definitely a Must Have!! !